Why put trash in a trash can, not the toilet? Trash, hair and grease in the sewer pipes create overflows which can harm human health and the French Broad River. Wastewater treatment plants use natural processes to turn dirty water into clean water and fertilizer before it is returned to the environment. 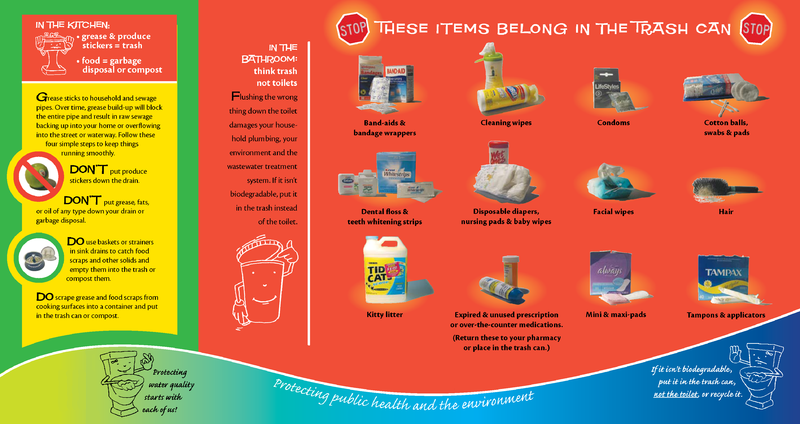 Not all chemicals found in medicines, cleaners and personal products can be removed during treatment. Choose natural, simple, biodegradable products and help keep chemicals out of our environment. Nothing disappears - drains and toilets are the first step to a clean French Broad River.